SCN: For many in our industry, electronics and technology were an early passion. When did you first discover your interest in the way electronics work? Michael McCook: As with many that grew up in our industry, music was the pathway to electronics. At age five I watched my mother learn the guitar and was exposed to Duane Eddy et al on the Magnavox needle dragger. The Beatles clobbered North America; followed a few years later by the ‘Summer of Love’. The bonfire for my musical emotion now had plenty of fuel. I began playing and finding my “soul” on mom’s guitar and that perpetual explosive combustion began. American Pop, Hendrix and Clapton had my ear along with a slew of obscure British progressive groups. In the ’70s I became proficient on the guitar and in songwriting, which led me to an A&R contract with RCA. All along I was modifying my guitars and amps. I had this powerful feeling in my gut that I could find something different, unique, better and special. To ultimately answer your question, I plucked a chord, touched my tongue to a 9V battery and the rest is history. Throughout the ’70s, in addition to riding motorcycles, McCook was modifying guitars and amps. opened my first business venture, MAS Audio in 1976. MAS was an esoteric ‘hi-fi’ shop and maintained dealerships with the likes of Transcriptor, Audionics, Spectro Acoustics, Wharfedale, BGW, and Crown, along with the usual support brands of that time. This was a very successful endeavor in the heart of affluent Bucks County, Pennsylvania and yielded the capital return to exercise the mother of invention. By way of pure customer demand, MAS filled the early shoes of creative custom residential installations and later blossomed into the commercial market. In 1984 I researched and experimented with loudspeaker and crossover designs and began to build and market a variety of MAS Audio loudspeaker solutions in both the residential and commercial spaces with excellent results and customer loyalty. Shortly thereafter in 1985 I was called in by KC Blair and Associates to develop a telephony-based audio system and conjoining it with a satellite video system for the new cutting edge MRTV (Market Research Television) Network. I remember calling Gentner wanting to buy their MicroTel balanced audio/telephone interface. I spoke with my now very good friend and at that time budding application specialist Cory Schaeffer, telling her what I was up to. “You can't build what you're looking for based on a Micro- Tel!” she replied. I promptly bought four MicroTels and was off to the races, incorporating them with a conglomeration of digital delays, pitch shifters, parametric equalizers, PZM microphones, and studio monitors. We successfully created an integrated system that was very close to CODEC quality audio with C Band satellite video at a fraction of the cost. I later came to regret not attempting to file a system patent. However, it got me in tune with the practice of protecting the hard work associated with intellectual property and this experience ultimately served me well in the years to come. In 1993 I met Andy Benton, one of ‘those’ British engineer transplants to the United States. We immediately hit it off, exchanging ideas, beer preferences, and sharing our passion to create. Andy at the time was pioneering his innovative company ‘Additional Dimension’, developing and producing a variety of cutting edge products. MAS Audio had added video to its punch and became a fullblown pro AV Contractor servicing the Northeast Corridor. Burning lots of midnight oil, I had a cocktail napkin arsenal of tool prototypes as well as concepts for products that would make a system integrator’s life easier. Andy and I engineered and produced a simple AV system diagnostic tool called TEST 1-2-3. We sold hundreds of these trouble-shooting devices while getting our manufacturing knees dirty and marketing chops tuned up. Andy and I loved every minute of it! In 1994, enter the Ben Franklin Technology Center (BFTC) and the birth of New Frontier Electronics, Inc. Our team at the time included Tony Keane, who was one of the world’s leading DSP coders. Together, Andy, Tony, and I developed the DSP2010EX, the first self-contained dual FFT, DSP-based audio analytical computer in a 1U chassis. By way of this effort we became an unprecedented three-time technology grant award winning company. In 1995 the SurgeX brand was born. Through a relationship between Andy Benton and magnetics guru Jack R. Harford, the New Frontier team began to explore and develop ‘Series Mode’ surge suppression technology into products specifically designed for the pro AV marketplace. We knew we were pioneering new technology and our approach was simple: tell the truth and have it based in physics. Market awareness and penetration was my personal task and I started from the top down. I relentlessly traveled the country visiting with the top minds in specifying consulting firms and explained why our pure non-sacrificial Series Mode filter technology was far superior to the antiquated MOV based shunt systems. To date we believe there is absolutely nothing that is superior technology wise with regard to advanced surge elimination systems than the Harford-Benton-McCook U.S. patents and the SurgeX product line. Motorcycling has been a life-long passion for McCook, who collects, restores, rides, and races ’70s-era machines. He has won divisional Motocross championships for the past five years. in the pro AV and CE markets. SurgeX technology finds an immediate home in many vertical markets with it’s utilization in all forms of government electronic integrated systems, IT, plug-in vehicle recharging stations and marine applications. All of these segments will find applicable SurgeX products in the near future. SCN: What is most often misunderstood about your product category? MM: The core differentiating technologies within the product category of “Power Conditioning.” Marketing departments are wildly spinning smoke and mirrors to confuse the buying public. There are huge differences with regard to the science, methodology, topology, and components utilized within this category. All electronic systems are built on an AC Power foundation and I would urge the integration community to thoroughly examine what is behind the faceplates of the products they are specifying for their AC Power platforms. For the most power on two wheels... That’s a loaded question! Everyone that knows me knows that I am a rabid motorcyclist and race Vintage Motocross here in the Northeast. I own several modern bikes, but for the most part I collect, restore, ride, and race ’70s-era machines, and I’ve managed to win divisional Motocross championships for the past five years running. The “most power” is subjective; it could be a tricked out ’77 Yamaha XS650 StreetTracker, a ’73 Suzuki TM400, a “worked” ’79 Yamaha YZ250F, or a 490 Maico. 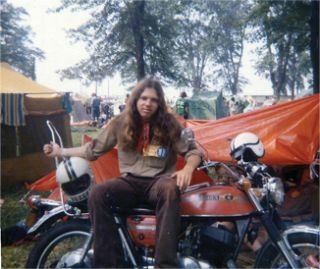 Motorcycling has been a life-long passion, which helps me to find peace and balance in life. It is impossible to predict...human behavior. But it’s possible to predict...the two primary driving components in life. Fear or inspiration cause change in human behavior. I’ve had my share of both, and I certainly prefer inspiration!